Overall, I gave Eco Pure Health Probiotics a 3 out of 5 stars. There are some things I really like about this probiotic. As the name suggests, it’s definitely more natural and “pure” than some of the other probiotics out there. There are only a few ingredients and I like it because there aren’t any artificial additives or chemicals. It’s also gluten free and safe for vegetarians. The price is very affordable and I think it’s a good value. The capsules are easy to swallow and you just take 1 – 2 per day depending on your specific needs. Make sure to take the capsules between meals or on an empty stomach. I didn’t see any side effects while taking Eco Pure Health Probiotics. 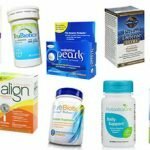 I actually felt good and noticed some improvement with my IBS symptoms such as bloating and constipation. It also has a 100% money back guarantee, which I’m always a huge fan of. This supplement is only for adults 18 years and older, so it’s not safe for kids. The cells are only guaranteed at the time of manufacture. And last, the Eco Pure Health website was down when I was writing this review, which is a bummer and odd. Overall, I do think it’s an above average probiotic and it may offer some help with digestive problems. In every capsule of Eco Pure Health Probiotics, there are 15 billion cells and they come in 5 probiotic strains. In particular, it uses Bifidobacterium bifidum in the probiotic lineup, which I’m a fan of. 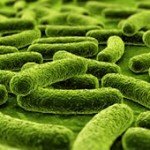 Studies show that Bifidobacterium bifidum may be able to aid in immune function and digestive function. It could potentially help reduce seasonal allergies and discourages the production of histamine. Another area this strain may help with is treating diarrhea, in particular diarrhea associated with taking antibiotics. I also like that is has Lactobacillus acidophilus in the strain profile. This is a well-researched probiotic and touts many benefits. It may help with traveler’s diarrhea, vaginal infections, chronic constipation, lactose intolerance, digestion, and high cholesterol. Lactobacillus acidophilus also may help balance out the bacteria levels in the body, boost immune function, and decrease allergies related to pollen. Studies also show that Lactobacillus acidophilus may potentially relieve the symptoms that come along with Crohn’s disease, Irritable Bowel Syndrome (IBS), and other digestive disorders. Eco Pure Health Probiotics doesn’t have any allergy concerns listed. It’s also really natural and “pure”, as the name suggests. It only contains a few added ingredients and ditches all the unnecessary chemicals and additives. It’s gluten free and safe for vegetarians. These are 2 big perks! The other ingredients include: vegetable cellulose, magnesium stearate, and maltodextrin. It costs $14.99 for 60 capsules, which lasts 1 – 2 months. 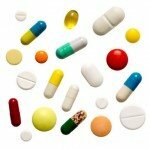 Depending on if you take 1 or 2 capsules daily, it ends up costing $0.24 – $0.49 per day. In both cases, it’s actually very reasonably priced. $0.24 per day is a steal for probiotics and $0.49 per day is also good. While taking Eco Pure Health Probiotics, I didn’t notice any negative side effects. I was expecting to see a little bloating or gas because it has 15 billion cells. This is a bit more than average but I actually felt good the whole time. I’d suggest this is more for a specific ailment, but in any case, I was a happy camper. Oddly enough, the official Eco Pure Health website was down when I was completing this review. The domain doesn’t seem to exist at the moment. 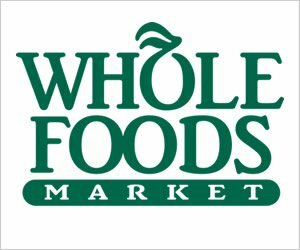 However, Eco Pure Health sells directly through Amazon, as well. 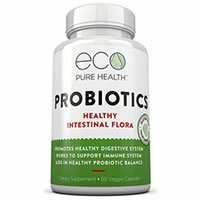 On their Amazon page, it says they have a no hassle guarantee and if you’re unhappy with your bottle of Eco Pure Health Probiotic for any reason, they will replace it or give you 100 percent of your money back. I wish their actual website was up, but I’m really happy to see this kind of guarantee offered! To buy Eco Pure Health Probiotics, click here.